We have the Champagne! We have the flutes! All that is missing is you! This is a quaint condo village in a beautiful setting with your own private picnic tables, BBQ grills and swimming pool. Couples or small families will love this beautiful one bedroom, one bathroom condo with a large pull out couch in the living room. This condo is literally steps to the Port Aransas beach via your own private boardwalk. 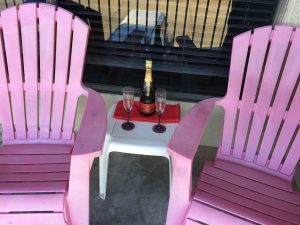 Grab your stuff and head out to the beach or enjoy a little quiet time on your own balcony sipping great Champagne in your colorful Adirondack chairs. Enjoy the multiple ocean peek-a-boo views you get from this condo or take a refreshing dip in the community swimming pool. It is a small complex, so you won’t be fighting the crowds for parking, pool space, or the trails to the beach here! When you want to explore, this location is so close to almost everything you will want to do in Port Aransas, including fishing, golfing, dining, shopping or viewing nature preserves. There are pamphlets and brochures in the condo showing what restaurants are here and what is happening in Port A to help get you started on your Port A adventure. Time to start enjoying the good life! With the 2 full beds in the one bedroom plus a large pull out couch in the living area that is great for kids, this condo is the perfect setting for a romantic getaway or a fun family trip. No gaudy turquoise or bright orange colors here, just a beautifully decorated and clean condo with festive beach colors and tasteful art. I hope you enjoy this place as much as I do. In the living room is a large very comfortable couch, coffee table and a huge new 48” TV and music soundbar across the room for catching up on the news or one of your favorite programs. Enjoy your very own private cinema! Don’t forget the popcorn! If you need to wash your clothes, a stacked washer/dryer is in the unit for all your washing needs. It is conveniently located in the back of your bathroom. Laundry detergent is on the shelf next to it. No need to go searching for the community laundromat and fight the crowds. The kitchen includes a gas range with 4 burners, microwave, blender, and coffee maker. It also includes brand new kitchen supplies including frying pans, baking sheets, mixing bowls, measuring cups, silverware, wine glasses-both red and white, drinking glasses, and a beautiful set of tumblers perfect for enjoying a nice drink by the pool. In the living area, there is plenty of counter space at the breakfast bar that easily seats 2 to 4 people. The dining table seats 4 or you can head down to your private picnic area and enjoy your food cooked on one of the several charcoal grills. Just a quick walk to the Gulf Coast, this condo is made for beach enthusiasts. If you need to drop off large umbrellas or beach chairs to the beach, there is a road one block west of the Condo to drive your heavy or bulky gear to the beach. If it is restaurants you are looking for, there are many excellent seafood, pasta, pizza and other style restaurants within a few minute drive. There are fishing charters, a gambling boat leaving twice a day most days for a ½ day of fun, water parks, nature reserves, and many other adventures to be had. It’s time to start yours! All photos included on this site were personally taken by me so they represent what you will see when you get there. All beach towels, kitchen towels, bathroom towels, hand towels, wash clothes, bed linens have been cleaned prior to your arrival and are ready for your use. Before arrival, you will be provided with your personal lock code to easily access the rental. No keys to worry about and we change the lock code after every visit. If you are interested in checking in early or checking out late, please contact me and I’ll let you know if it’s available. All rentals will include local and state taxes of 13%, and a small cleaning fee. A charge of $300 will be made on your credit card and released once the condo unit has been inspected for damage or lost items. Many condos charge you for a $59 Property Damage Protection insurance policy which drives up your cost, so we do what we can to help keep your rates low. If you prefer this insurance, then no refundable deposit will be charged to your card. I look forward to your business and thank you for taking the time to review my condo details. If you have any questions, please ask! This unit won’t last long so book now and start planning for your next adventure! Bon Voyage!